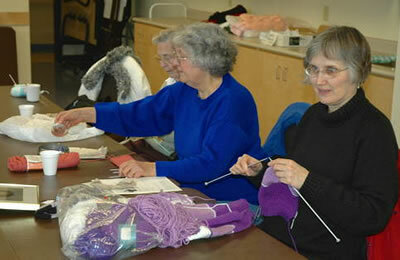 A warm welcome to the Knotty Knitters. We knit, embroider, crochet, laugh, exchange jokes and exchange family happenings. If we run into a problem on a project, we help each other out. Beginners are also quite welcome. We sell items from the showcase and at our two annual sales. Perhaps a new Baby is on the way? Thinking of Christmas presents? Try shopping at the Knotty Knitters. Someone is always happy to help you. The hugs and smiles are always free and lasting friendships are formed. So feel free to stop in at any time and stay for a look and chat; we love to talk. If you wish to join us please do, you will be more than welcome. Remember we are not strangers, only friends you have not yet met.